Over to fantasy figures for the first time in this LPL for me, with a team of Reaper dwarves. Lovely figures loaded with detail, as you’d expect from Reaper. These short fellows are a lot of fun to paint, although picking out all the buckles, belt bags and bits can seem like an endless process. 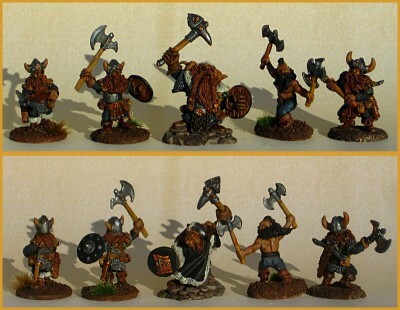 The Blackstone Guard – Reaper Minis dwarven fighters. Click to see full size, as usual. I’ve painted these warriors up in almost all black livery, although the main colour on them is their extravagant dwarven beards and long hair. Apparently this particular clan of dwarves runs strongly toward red hair. The current round of the Lead Painters League is ongoing over on the Lead Adventure Forum; go check out all the awesome painting on display!